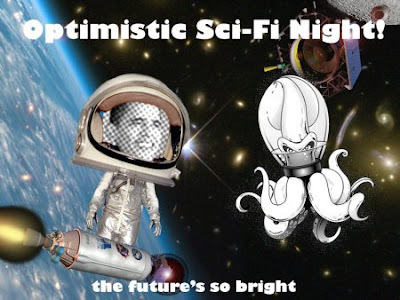 I feel duty bound to report I’ll be reading tomorrow with the illustrious likes of Jessica Reisman, Don Webb, Stina Leicht, and the cast and crew of Space Squid. If you’re in the Austin area (or can get here between 4 pm and 8 pm tomorrow), meet us all at a place I’ve never heard of that moves 2,000 books per day, Frugal Media (5400 N. Lamar in Austin, Texas). Tasty refreshments* have been promised, and also optimistic SF/F. Knowing the local crowd I expect ‘optimistic’ to be interpreted broadly.